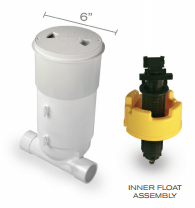 Paralevel is an innovative water leveller, that is continually working behind the scenes to ensure that your pool and spa remain at the ideal level. The pools water level is monitored and adjusted automatically if needed. Unlike other water levellers, Paralevel offers “Smart Sensing” which means it will ignore water sloshing in the pool and will only sense the pools true level. This feature also protects the Paralevel by preventing it from rapidly cycling on and off, preventing premature failure. If needed manual adjustments can be made easily by the “Posi-click”, where a full turn equals 6mm (1/4”) of water level adjustment.